“Poverty is just a state of mind. It does not mean the scarcity of food, money or material things. 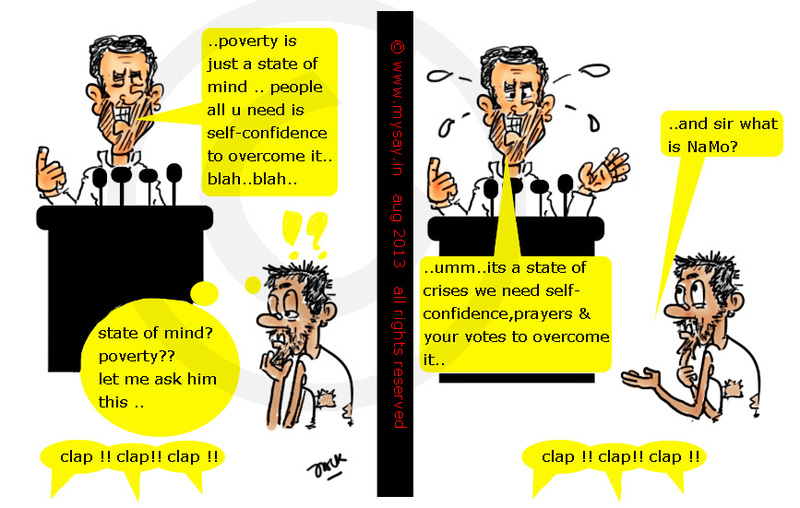 If one possesses self-confidence, then one can overcome poverty,” Rahul Gandhi. Wow! New definition. Should be added to dictionary. I don’t blame Pappu ! He is from a billionaire family and very much cut from the ground reality… Plus we don’t expect anything sensible from him !! Is being the PM also a state of mind? I dread the future if the nation has these mental rulers!! Awesome doodle! ‘Poverty is just a state of mind’-what phoney, stupid statement! He isn’t poor or he would really not be saying this! hahaha… I feel he is a little unlucky .. the media always makes a mockery and mess of his statements what he meant was taken in a wrong note .. Thanks Jaseema I am glad you liked it ! It just proves one thing: we are crazy to give him power to utter such nonsense. Throw out Congress out of the power forever. This will give other politicians a clue as to what they can say. hahaha … Rahul Ji the inner confused state of nomad ! Nice one …. rahul gandhi entertains whole india by his funny thoughts. The stench of the attempt to come up with such a definition of poverty, the worst curse of life and a stark reality to millions of Indians, is stifling. One has to be famished to know what poverty is. Sir .. I feel he is not in a right state of mind himself 😀 to define poverty as a state of mind . what say ? nice piece of information, I had come to know about your internet site from my friend vinay, delhi,i have read atleast 12 posts of yours by now, and let me tell you, your website gives the best and the most interesting information. This is just the kind of information that i had been looking for, i’m already your rss reader now and i would regularly watch out for the new post, once again hats off to you! Thanx a ton once again.